Sometimes Halloween decorations can be scary, dark and downright disturbing. So we wanted to bring you a different option. Country Halloween decor that you would be happy to show off. In looking up Halloween history, it was shocking to find that Halloween has been celebrated for a couple of thousand years. In North America, it was first observed in 1911. As you can imagine, the look of Halloween has changed over the years. We think it’s time to bring a country Halloween decor look to a rather dark holiday. Kind of like we did last year in our trilled but not spooky Halloween decor ideas. Our friends have done just that, and we want to share with you their beautiful creations. 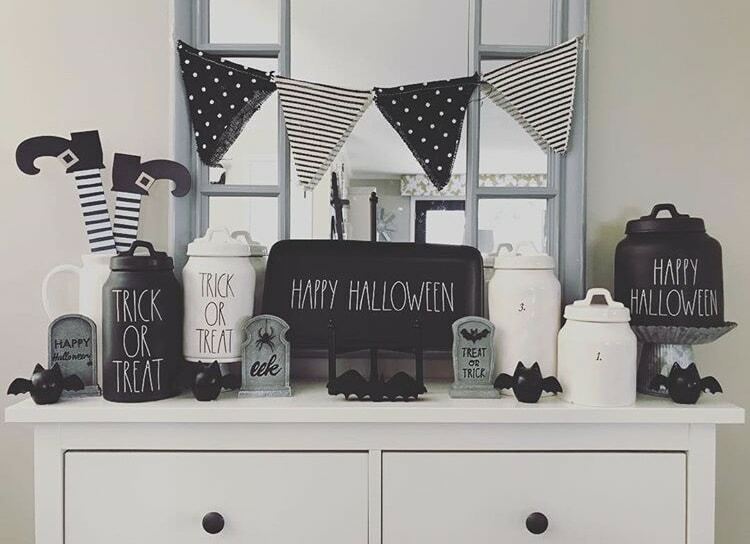 A classy black and white look is easy to create in your Halloween decorations. 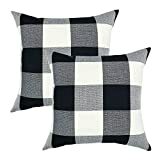 Buffalo check is chic and carried from holiday to holiday. We wrote about the trend of buffalo check in Christmas decor. If you’re looking for some vintage Halloween decorations and having a hard time finding some, incorporating an old scale with pumpkins is adorable. 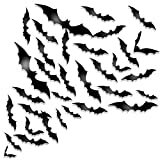 Bats, spooky silhouettes and spider webs can still be used in the classy look of Halloween. Jaesie’s decor is perfect! 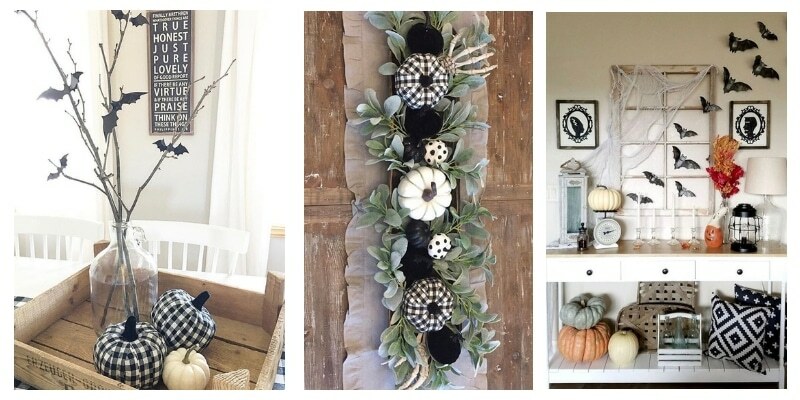 Farmhouse pieces are enhanced in this look and the different gourds used are striking. We couldn’t leave out tiered trays and Rae Dunn. 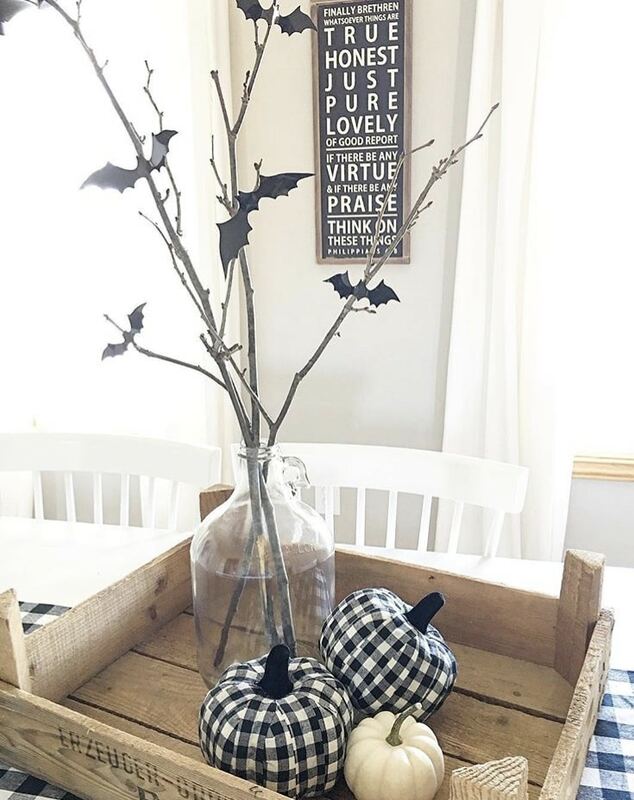 The black and white pumpkins, hocus pocus and pumpkin patch signs are fun in a farmhouse. 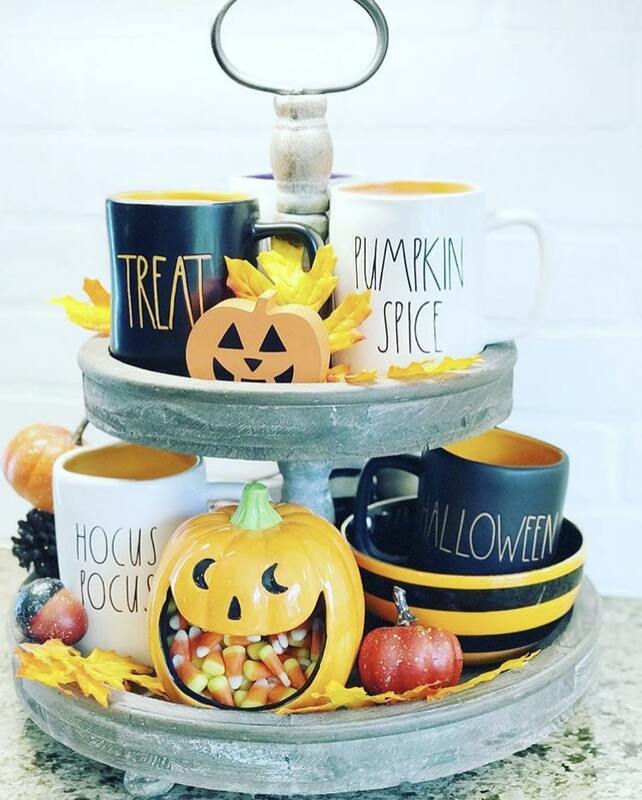 All of the Rae Dunn pieces would make your coffee time spooktacular for sure! Claimed Corner Mini Coffee Mug Rack - 4 Row Metal Wall Mounted Storage Display Organizer for Coffee Mugs, Tea Cups, Mason Jars, and More. Rita has assembled great items in this dough bowl! 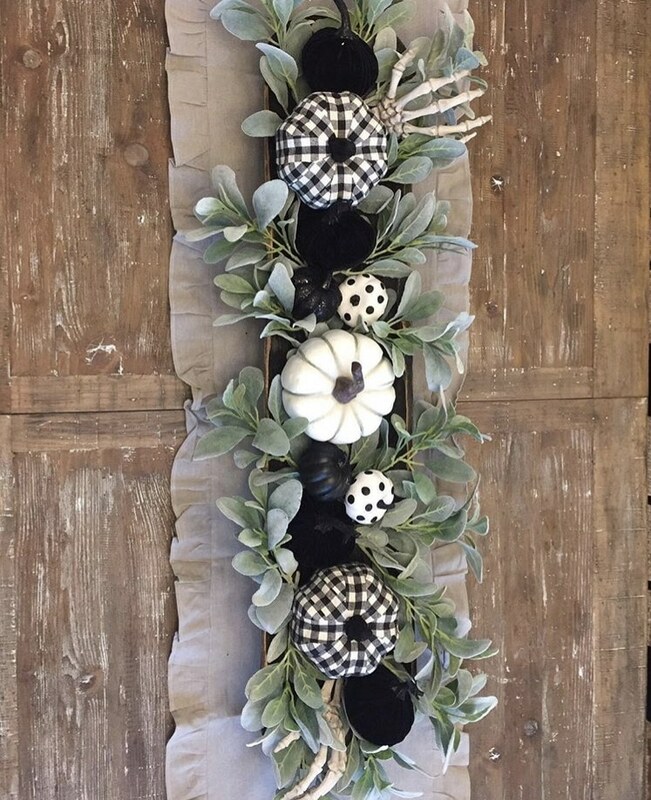 From pumpkins to sprigs of lambs ear, to the hair-raising skeleton hands all come together to create a classy Halloween centerpiece for her table. If you don’t want to break the bank while decorating for Halloween, here is a nifty idea for you. Cut bats out of black construction paper and attach them to twigs you find in your yard. Instead of placing your batty creations in a flower vase, try putting them in a glass jug. 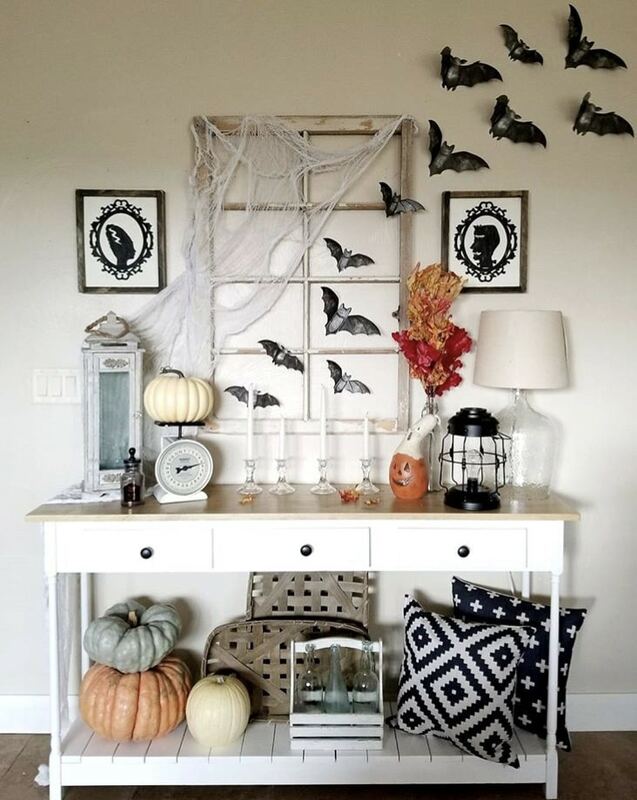 Making a classy Halloween vignette out of your creation in a wooden crate with some pumpkins you have already on hand won’t break the bank, but will be eye-catching. 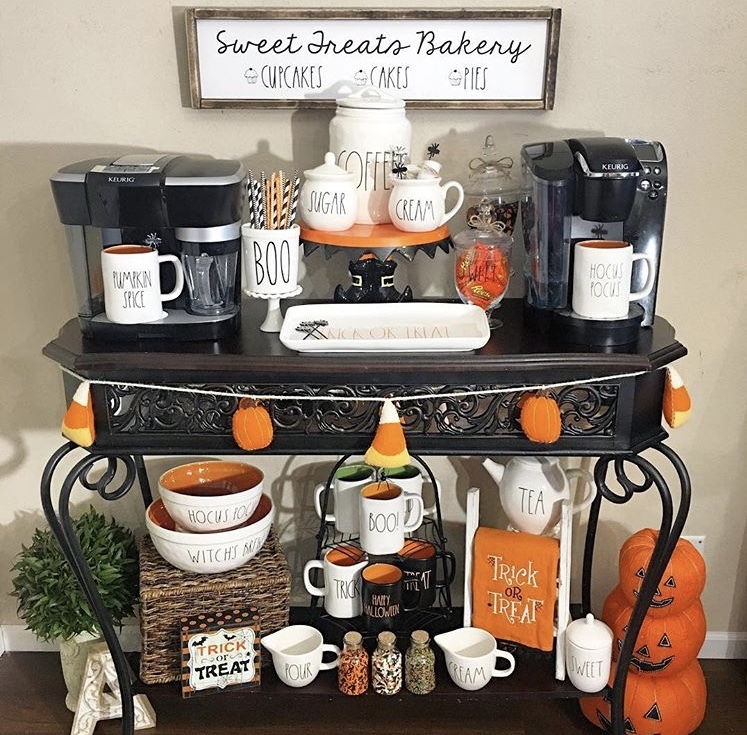 If you want to set up your coffee center for Halloween, grab some ideas from Jaime’s home. 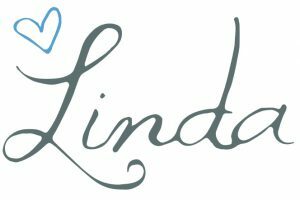 From her many Rae Dunn pieces to her chalkboard with a witchy message, to her letter board, down to her precisely colored garland, Jaime has you drinking in the holiday. This is the perfect trendy fear-inspiring look! We haven’t forgotten about those of you that like Halloween witch decorations! 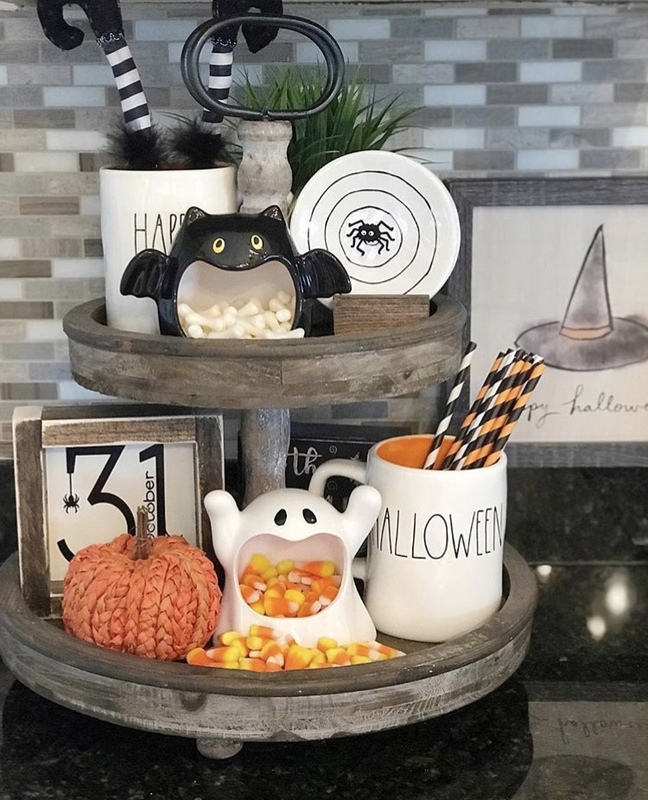 This tiered tray topped with witchy legs sticking up out of a Rae Dunn mug add a “just about to cackle” to this display. And don’t you love the bat and ghost spilling candy out for all to enjoy! This set up is sweet (pun intended)! If ever there was a set up that could get you through an evening of passing candy out to trick or treaters, it’s this one for sure. 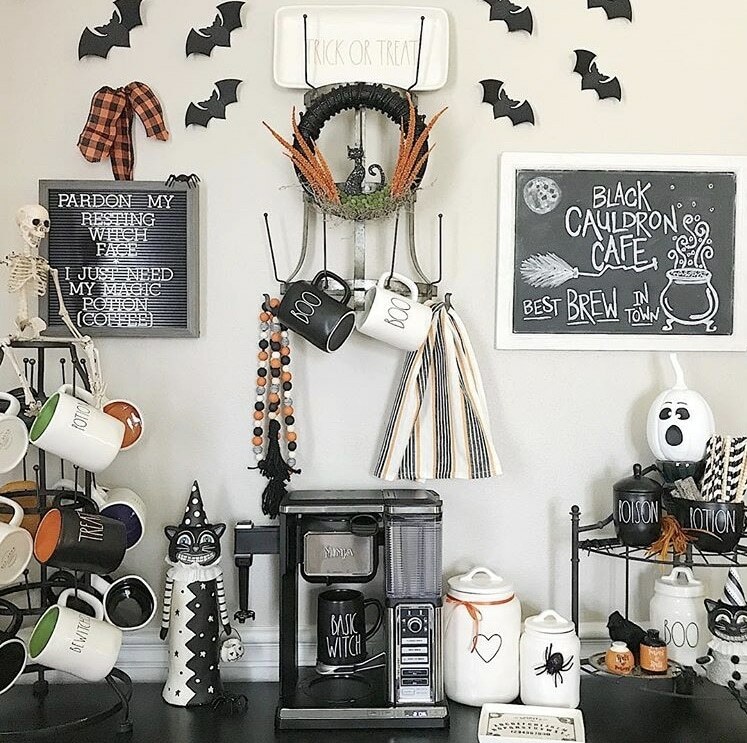 The coffee fixings are galore, and there isn’t just candy for your tummy, there is plenty of eye candy with all of the country Halloween decor. The witch legs here will leave you with a giggle and a feeling that she dove into Halloween decor head first! There are some great black and white Rae Dunn pieces, and the banner is the work of a master decorator. This tiered tray looks easily transformed from a fall tiered tray like those we featured. Just changing out a couple of pieces on each level gives you the new look of a different holiday. 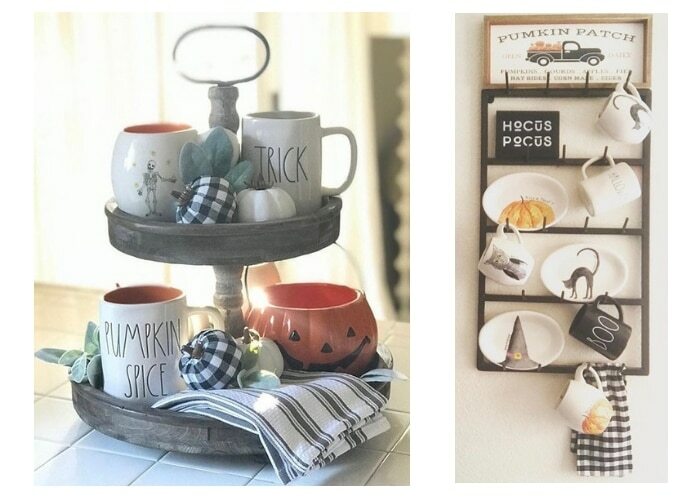 These country Halloween decor looks like it is full of yummy treats and a couple of tricks. Our friend Pam didn’t disappoint when she put together her tiered tray! Her use of fall leaves and Jack ‘o Lanterns bring color and a smile to all. 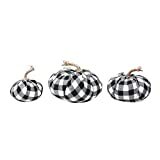 Black, white and orange are classic and can bring the vintage feel to Halloween decorations. 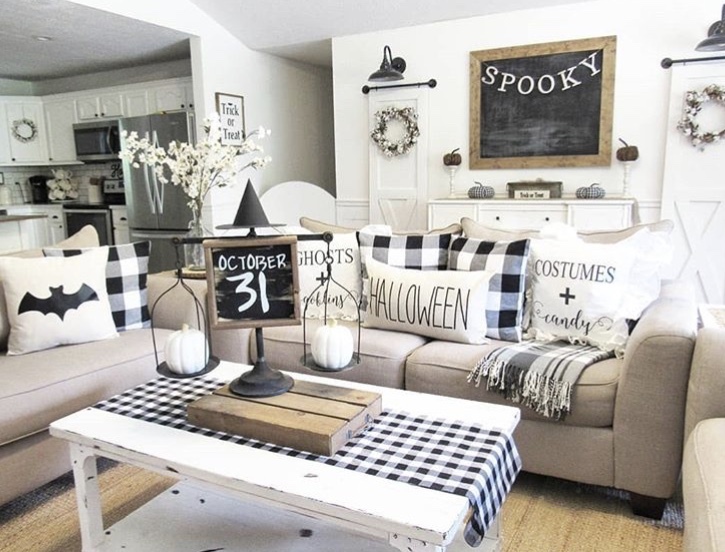 Hopefully, you’ve been inspired to add some country Halloween decor to your home. I know we have been inspired. In fact, it got us motivated to do some Halloween decorations. Click Halloween decor to see what ideas we stirred up. 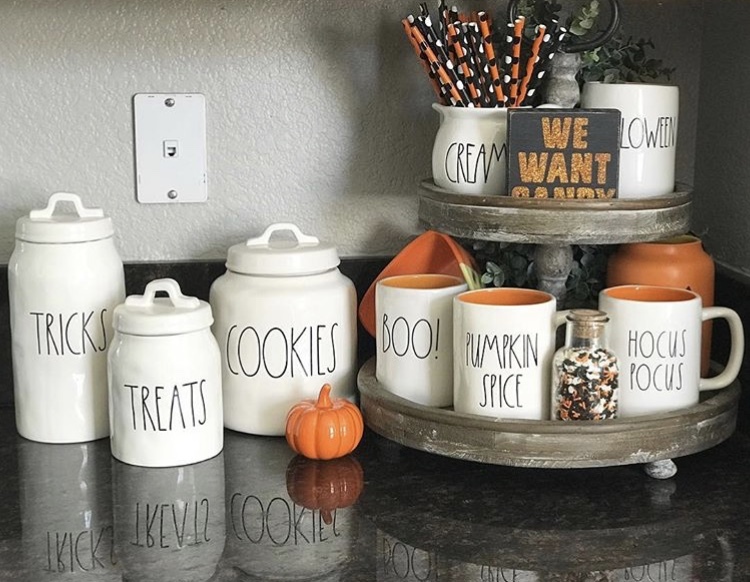 Just a couple simple tweaks from your fall decor, and you will be ready for trick or treaters on October 31st before you know it.